Ah, color, it’s the one quilt ingredient we all seem to stress about, and no wonder, because a quilt stitched in colors that don’t quite click rarely makes it to our list of favorites. 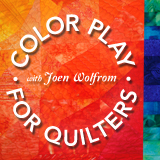 Not to worry though, because Joen Wolfrom’s Visual Coloring will erase any anxieties you might have about choosing colors for your quilts. There are several excellent color books out there, including other texts by this author, but none of those books approaches the subject in such an easy to understand manner. Ms. Wolfrom explains how to use Visual Coloring techniques to find and explore the colors that move you. She shows you how to use photographs to translate the colors you see in nature to fabric. Numerous two-page spreads put her methods into practice by displaying a collage of illustrations: a photograph, swatches of fabric chosen from colors portrayed in the photo, and an example of a quilt made by combining the selected fabrics. Don’t be fooled into thinking that the techniques are meant to help you choose colors and fabrics for landscape quilts — they teach you how to design any quilt by encouraging you to expand your color horizons and helping you see color combinations in a different way. Visual Coloring includes five quilt patterns, all designed by using the colors in nature photographs. The patterns provide a wonderful exercise to help you put the book’s methods into practice. If you can only buy one book about color, put Visual Coloring at the top of the list of texts to explore. You needn’t have any color experience at all to be successful, but this book isn’t just for novices — even experienced quilters will benefit from the techniques used in Visual Color. Don’t limit yourself to coloring quilts, because the techniques in this book appear to be perfect for converting your entire home’s decor into any type of setting you can imagine. Empowerment is a strong strong word, but I wholeheartedly believe this book provides it. Following the author’s advice will eliminate your color woes and increase your confidence by leaps and bounds. Joen Wolfrom has been making quilts since 1974 and is the author of nine books on quilting, including others on using colour. This book is filled throughout with glorious photos of landscapes, plants, trees and any object that is full of colour. Joen’s method involves starting with a colour photo for inspiration. She recommends you enlarge this to approximately A4 size if possible, as enlarging the image allows you to see the colours more easily. She encourages you to really look at the image; for example if it is a leaf it will not be just one green, and there may be other surprising colours there too. There are also pages showing a selection of images and the quilts made using that colour scheme. In the second section of the book there is a gallery of quilts and inspirational photos. What is exciting about this section is that the same collection of photos was sent to a number of quilt makers and they chose the one they wanted to work with and created a quilt. The fact that they are made by different people means that they vary widely in styles and techniques, but you can still see the relation to the colour images. The third section contains four projects, all suitable for a confident beginner. The book only takes you as far as piecing the tops, so if you need help with the finishing process of layering, tacking and quilting you will need to refer to a basic quilting book. If you are the sort of person who rips out pages from Sunday Supplements because you liked the colours, you will appreciate this book. This is one of the best quilting books I’ve read in a while. I actually borrowed it from the library at first, read it, and was so impressed that I decided to buy it. Joen Wolfrom’s approach to color is simple and natural, her ideas are easy to follow, and the quilts in this book are inspiring. While I usually design my own quilts, some of these were so appealing that I will be duplicating them. I’m sure you’ll enjoy it. Visual Coloring is a great concept for quilters. The book has fabulous pictures and ideas. The book contains some patterns of the quilts used as examples; however, I would really have liked to have had patterns for each of the sample quilts. Wow!! What an awesome book. I highly recommend this book to anyone who appreciates beautiful quilts and just how hard it is to pick out the perfect fabric. Lots of stunning color combos and info on how to use it in your stash.